New Delhi, India, June 26, 2015 – LocalCircles (https://www.localcircles.com/a/), India’s leading Community Social network today announced the availability of Online Citizen Communities or Groups for the 100 proposed Smart Cities of India. The citizen communities enabled over the last month bring together citizens locally so they can get and stay connected, work together on giving inputs on city issues and solutions, participate in governance and work together with each other and the administration to make their city better. Over half a million citizens, who have inclination to make their city better in some way have been given access to the communities that cover all the 100 proposed Smart Cities of India. Communities for another 50 cities are also in the process of enablement and will be up and running before month end. 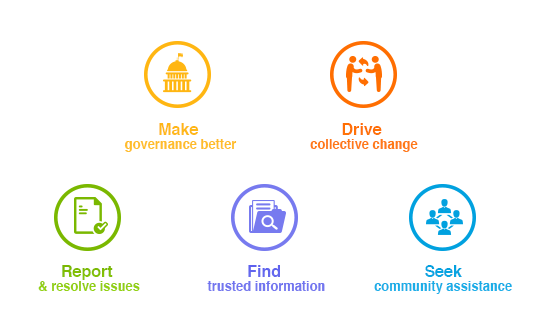 “The connectivity of citizens at a local level is the first step to good local governance as issues, solutions and the collective action to make it happen, all emerges from within the community”, said Sachin Taparia, Chairman and CEO of LocalCircles. “If the city administration is willing to work with the citizens and get engaged, it will significantly increase the chances of success of an initiative like the Smart City Mission”, continued Taparia. The city administration which will soon be given access to their respective local community can seek inputs on various local issues, causes, solutions as well as run citizen polls on various initiatives to better understand the collective pulse of the local community in real time. Also, they can share important updates with citizens ranging from an emergency situation to closures, social events, cleanliness drives, etc. which will be delivered in real time to the citizens in the community.